This fast of detoxification and cleansing based on the Ayurvedic Science, is an invitation to take some time for you, to rest and purify the organism and prepare it for the new cycle. In this rhythm that we are living, a regime of cleaning and purifying is more vital than ever for our health. Our bodies and minds are asked to process an endless interference of harmful factors, such as environmental toxins, processed foods, unresolved emotions and psychological stress. Over time, these stressors can cause toxicity to accumulate in the system, deposit in the tissues and endanger our health. A periodic cleaning helps eliminate these accumulations of the body. Improve digestion and metabolic function. Encourage an enhanced sense of energy, vitality and enthusiasm for life. Promote clarity, spiritual and emotional. Encourage a balanced sleep cycle. Promote the improvement of health in general. 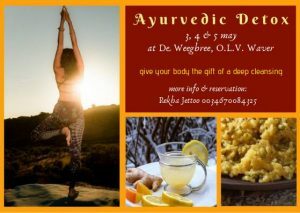 Specific yoga postures for the digestive system, breathing exercise, understanding the ayurvedic approach, learning about spices and there medicinal properties and sweetlodge.